This is the distressing moment a father was beaten by a mob in in Argentina after his ex-girlfriend allegedly falsely accused him of trying to kidnap their daughter. 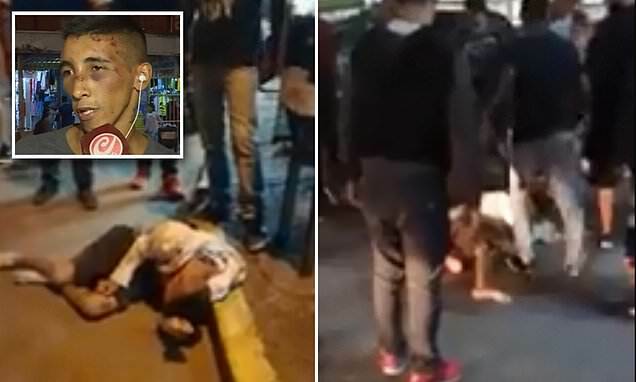 Cell phone video footage captures the moment a man, who identified himself as Nahuel, 21, was brutally attacked outside a train station in the province of Buenos Aires this week. A male vigilante is spotted in the disturbing image kicking the defenseless dad's face. Soon thereafter, another man reaches down and grabs Nahuel by the pants and drags him down the street while residents shout at others with cell phones to take pictures of him. The savage assault occurred Monday night after Nahuel tracked down the woman, who was identified as Soledad, 24, after she allegedly took their 11-month-old child from his home without his permission. The police is still working to locate Soledad to reunite the dad and the baby.